The introduction of Information and Communication Technology tools in the architectural practice can be challenging. This chapter discusses an educational approach to teach Geographic Information Systems to architecture students in the Barcelona School of Architecture. The methodology uses a combination of theory lectures, worked-out examples with faded guidance using a real-world case of study, and self-directed discovery in a project-based learning activity. The results of pre-course and post-course surveys are also discussed to illustrate the workflow of students when using spatial data, their perception on using GIS applications, and their impressions regarding the development the course. Finally, the possible reasons for the limited adoption of these tools in the architectural field are also discussed. Although the roots of the architectural profession span back for millennia, the use of Information and Communications Technologies (ICTs) in the knowledge areas of architecture (Penttilä & Weck, 2006) and urban planning (Norte Pinto, Lancrenon, & Berchtold, 2014) has not been uncommon since the beginning of the century (Rivard, 2000): architects increasingly use software tools to visualize the building in different stages of the design process; to analyze the behavior of structures under different loads; to optimize the HVAC (Heating, Ventilating, and Air Conditioning), sewage, plumbing and electrical systems; to estimate the cost of buildings before they are built and control the expenses and scheduling during their construction; to simulate the effects of solar radiation and wind dynamics: to calculate the thermal and noise insulation required; to produce, manage and transmit documentation in team collaboration; to search information about technical specifications, regulations and competitions; and to disseminate the results of their work to customers and fellow architects, among others. However, these skills rarely receive formal training in the field of architecture, possibly because the quick pace of technology added to the extended duration of architectural studies makes the knowledge of many of these tools obsolete during the course of the students’ tuition. Nevertheless, the authors believe that strong ICT skills provide students with the right tools to adapt to technological change effectively (Stone Wiske et al., 2001) and should be included in the formative years of the architectural education (Wang, 2009, 2011). In addition, part of the architectural profession is wary of the introduction of ICTs in their practice, ignoring its benefits (Moum, 2006) because of the perceived disruption in the established workflows, even though technology can be a valuable tool to deal with the increasingly short turnaround times of architectural design projects. In addition, the belief that new tools can interfere in the creative process (Şenyapili & Basa, 2006) makes their adoption difficult; while it is obvious that the introduction of a novel technology in a discipline can have a great impact in its development, the successful incorporation of new items into the professionals’ toolbox (Bouchlaghem, Shang, Whyte, & Ganah, 2005) should translate into a richer creative environment, even in the earlier stages of design (Knight, Dokonal, Brown, & Hannibal, 2005). The complexity of the architectural work involves dealing with a plethora of different inputs. In the architectural field, the “genius loci”, or the principle that architecture must adapt to its context is seldom disputed; therefore, the concept of place (the location of the architectural object but also its socio-cultural and historical background) is of utmost importance and permeates all the stages of the conception of the architectural form. Geographic Information Systems (GIS) are used in multiple knowledge areas when the object of study has a spatial component (geography, ecology, economics, sociology, transportation, etc.). The capacity of GIS tools to relate multiple layers of information from different sources through its geolocation in multiple scales with high geometric accuracy is very valuable in various areas in the architectural field: urban and territorial planning, project design, landscape architecture, real estate valuation, and heritage conservation. Despite the suitability of GIS tools for the multifaceted and multidisciplinary nature and the complex demands of contemporary architectural practice, its adoption has not been as enthusiastic as with CAD (computer-aided design) and CAAD (computer-aided architectural design) or, more recently (Çetiner, 2009), with BIM (building information modeling). 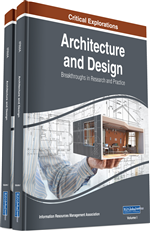 This chapter tries to explain the limited adoption of GIS tools by architects.